As Fall progresses along, so does my home decorating. One of the things I do that annoys my husband is the constant changing of the home decor and furniture rearranging! He's very tolerant and often pitches in to help with the design. He's got a good eye! You may have seen my early fall decor in this post at the beginning of September. Since Halloween is around the corner, I have changed up my decor to reflect the fun of the upcoming holiday. I don't go overboard, but I do like to have a little bit of fun in the house! 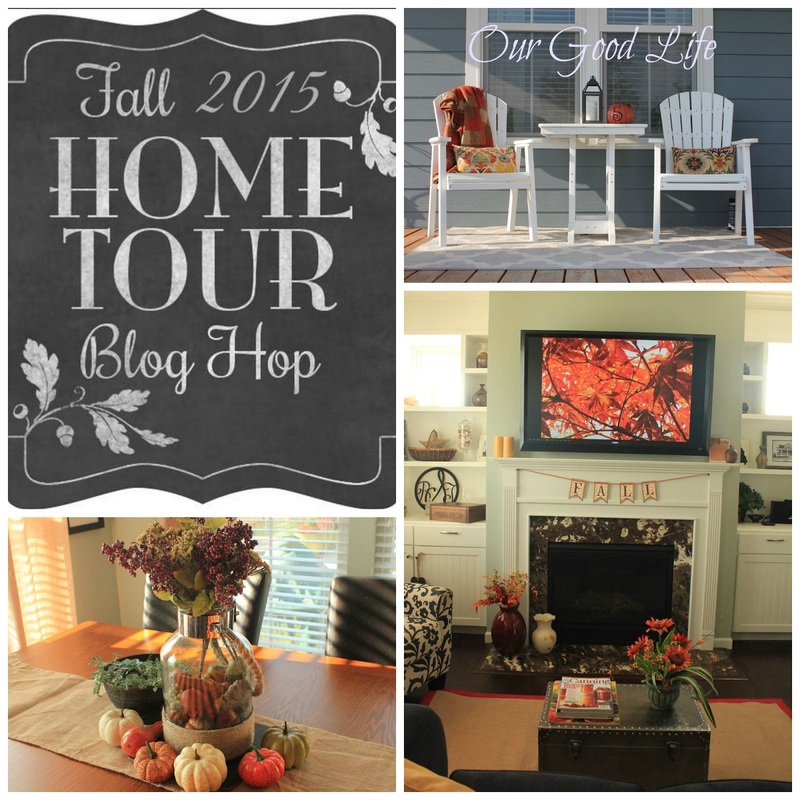 I am participating in Fall 2015 Home Tour Blog Hop hosted by Michelle at ShelString Blog. Go and visit her for amazing ideas on all kinds of home decor! So for this Fall Home Tour, I am going to show you just a little about our Halloween decor. We don't do super scary, most of what I like has a whimsical factor to it. Things that I saw that I loved. No real "theme" like rustic, or victorian, or modern. Just whatever strikes my fancy! My living room is very small. The largest piece of furniture is a love seat. It suits my husband and me fine, except for entertaining. I am learning how to entertain on a much smaller scale! Do you see the little scrapbook on the trunk? It is full of Halloween pictures of my daughter. She turns 30 this month! This cute pumpkin is a dried gourd. So cute and I had to have him when I saw the price was $5. Found in a local store here in St. Charles. Don't you love the fall saying? I found it on a blog (sorry, forgot the source) as a free printable. Free and cute make me very happy! The big grin on this cat's face reminded me of my cat, Bustopher. He was always up to something mischevious. Love this little felt pumpkin. It was found at my favorite store, Randolph Mercantile, in Moberly (MO). They have a Facebook page. I always stop by when I go to visit my mom! Another Randolph Mercantile find. This adorable little pot and the Trick or Treat sign. The kitchen doesn't have a lot of Halloween decor but I try to make the pieces count. On top of the refrigerator is a wood pumpkin my dad cut and painted. His snarly face is so very Halloween! The white pumpkin on the island was made by me last year at our neighborhood Pinterest Party. The vinyl cut outs were made by a friend here in New Town. She made the Hello sign on my front door, too. One talented girl! My dining area with my favorite decorations: Truman and Wilson! They followed me all around while I was taking pictures. Their patience was finally rewarded! I made this arrangement from Dollar Tree goodies! I am in love with it. It looks more decadent in person, where you can see the sparkle and shine. The colors are pretty, too. I'm saving my outdoor Halloween decor for a future post! Check back in and see what I have instore for you. I'm going to take you around this fabulous neighborhood I live in to show you what we do here in New Town! It's a blast! Be sure and visit all the other blogs that are hopping with Fall Decor today! You will not be disappointed!